This bright and modern apartment with 2 bedrooms is situated in the Barceloneta area of Barcelona, right by the beach. 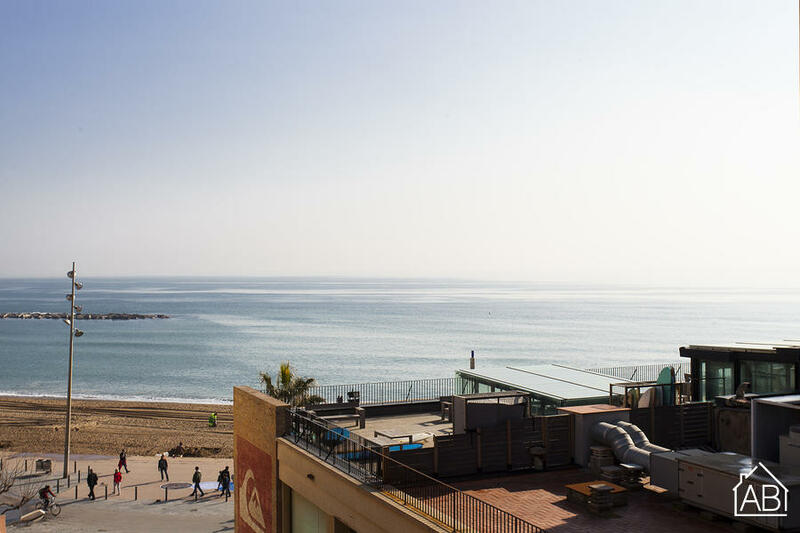 The Barceloneta neighbourhood offers many great restaurants, bars and supermarkets, and there is a cinema and shopping centre in the nearby Port Vell area. There is quick and easy access to the city centre from Barceloneta by public transport and on foot you can reach the Gothic Quarter and Born areas in less than 20 minutes. This cozy apartment has amazing sea views from the balcony and the cozy. The fixtures and fittings are all modern as the apartment has been recently renovated. The apartment has 2 bedrooms with a double bed in each, and 1 modern bathroom, making it ideal for two friends or couples looking to rent in Barcelona. The apartment comes with a new and well equipped kitchen, allowing you to prepare your favourite meals or try out some new Spanish dishes. In the living room you´ll find a comfortable sofa and a TV, so you can kick back and relax after a long day in the city. The apartment comes with a washing machine, heaters and air conditioning, for maximum comfort and convenience.